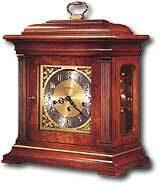 * Mr. Tompion was a founding member of Englands famed Clockmakers Guild of the 1630s. * Rare Carpathian elm burl facing on the door. * Case design is accented with golden decoration. * Glass sides and mirrored back reveal the movement. * Brass finished dial offers silver chapter ring. * Key-wound, triple chime movement with chime silence option and durable bronze bushings. 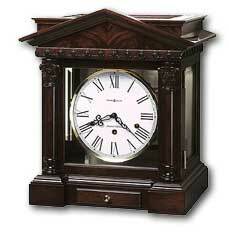 * Neoclassical details highlight the massive pediment of this Limited Edition mantel clock. Only 2000 of these clocks will be crafted, and each clock will bear an engraved plate with its production number. 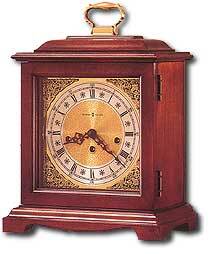 * This unique clock features crotch-figured mahogany on the pediment. Ornately carved column caps and carved wrap-around molding add elegant points of interest. * Beveled glass panels on the top, front, back, and sides offer a view of the polished brass nine-bell chime movement and pendulum. * The glossy white dial features Roman numerals, serpentine hands and a polished brass bezel. * The polished brass-finished pendulum, case floor, hinges and pulls complement the polished brass nine-bell chime movement. * A small lined drawer in the base provides convenient key storage. * Key-wound, triple chime movement with automatic nighttime chime shut-off option and durable bronze bushings. * Brass finished dial offers a silver chapter ring and decorative corner spandrels. * Key-wound, Westminster chime movement with chime silence option and durable bronze bushings. 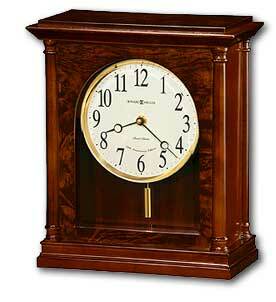 * This attractive mantel clock combines classic style with contemporary details. * Wood columns frame all four corners of the case; elegant burl adds a touch of luxury to the front and top panels. * The front beveled glass offers a view of the off-white dial, which features a polished brass bezel, Arabic numerals, and stylish black hands. * A unique polished brass, cylindrical pendulum complements the bezel. * Quartz, dual chime movement plays Westminster or Ave Maria chimes, and features volume control and automatic nighttime chime shut-off option.